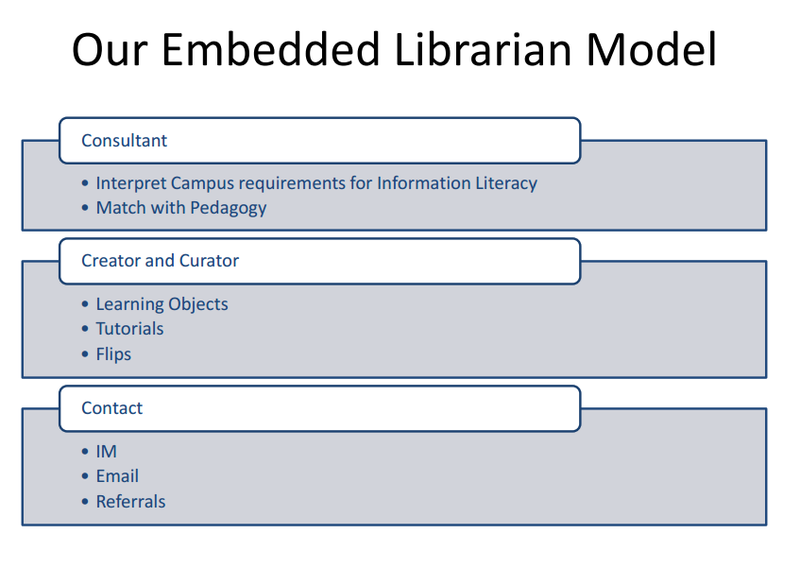 Libraries on large university campuses, like our own, are faced with the question of how to deliver embedded library instruction to a large number of diverse classes in the online and blended environment. Two common paths taken are 1) subject librarian participates in the online course or 2) successful completion of a self-paced information literacy tutorial is required for all students. My colleague, Kristin Woodward, and I have developed a third way: integration of an Information Literacy Tutorial that can be tailored to meet the specific learning outcomes of a course. Seeking to lead a successful, sustainable incorporation of information literacy into the General Education Curriculum as an Essential Learning Outcome our library needed to prove its ability to scale its instruction program. We understood that scaling our instruction program required an integration and assessment model that would be adaptable across disciplines. We utilize the backward design method when consulting with instructors and faculty. 1. Learning Outcome – What do you want students to be able to do? 2. Learning Object – What do students need to know in order to do it? 3. Student Application – How will students demonstrate they can do it? 4. Faculty Assessment – How will you evaluate their work? We have utilized this model in undergraduate and graduate courses, in GER and upper-level disciplinary courses, in small and in large classes. In some cases the first attempt at integration was not as successful as faculty had hoped. During subsequent consultations we have been able to better identify and define the learning outcomes in order to improve both the instruction and the application resulting in a better assessment, i.e. attainment of the learning outcome. Currently we are testing our model in a new and exciting opportunity as our university begins to offer Flex programs in January 2014. Stay tuned for future posts on the rollout of those programs.